Stacked Ham, Melted Muenster Cheese and Dijon Mustard on a Croissant. Hot Ham, Turkey, Bacon, Swiss Cheese, Tomato, Lettuce and Mayo on a Grilled Onion Roll. Hot Turkey, Ham, Salami, Swiss Cheese, Onions, Lettuce, Tomato, Sliced Black Olives, Pepper Rings and Italian Oil on a Grilled Sub Roll. Hot Corned Beef, Swiss Cheese, Sauerkraut and Russian Dressing on Grilled Light Rye. Melted Colby Cheese, Muenster Cheese, Tomato, Lettuce, Onions, Olives, Mushrooms and Italian Oil on a Pita. Hot Corned Beef, Swiss Cheese, Cole Slaw and Russian Dressing on Marble Rye. 1/2 Pound of Roast Beef, Colby Cheese, Cole Slaw and Russian Dressing on Marble Rye. 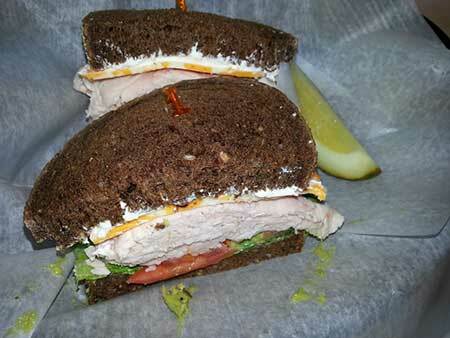 1/2 Pound of Roast Beef, Turkey, Swiss Cheese, Tomato, Lettuce and Horseradish Sauce on Triple Light Rye. 1/2 Pound of Hot Corned Beef, Tomato, Lettuce and Russian Dressing on Triple White Toast. Turkey, Swiss cheese, Sauerkraut and Thousand Island Dressing on Grilled Light Rye. Hot Roast Beef, Cheddar Cheese, Bacon, Tomato, Lettuce and Horseradish Sauce on a Grilled Onion Roll. Hot Pastrami, Swiss Cheese, Sliced Onion and Thousand Island Dressing on Grilled Light Rye. 1/2 Pound of Corned Beef & Pastrami, Swiss Cheese, Onion Slice, Tomato, Lettuce and Thousand Island on Triple Light Rye. Grilled Chicken Strips, Provolone Cheese, Romaine Lettuce and Caesar Dressing on Light Rye Toast. Roast Beef, Havarti Cheese, Mushrooms, Onions, Tomato, Lettuce and Horseradish Sauce on Marble Rye Bread. Hot Chicken Salad, Swiss cheese, Tomato, Onion and Black Olives on Whole Wheat Bread. Hot Ham, Colby Cheese, Bacon, Lettuce & Tomato with Ranch Dressing on Pumpernickel. Swiss Cheese, Cole Slaw and Russian Dressing on Grilled Light Rye Bread. Smoked Turkey, Cream Cheese, Colby Cheese, Onion, Tomato, Lettuce and Guacamole on Pumpernickel. Ham, Swiss cheese, Pineapple and Honey Butter on Grilled Cinnamon Bread. 1/2 Pound of Hot Pastrami, Turkey, Havarti Cheese, Mushrooms, Onions and Russian Dressing on Triple Rye. 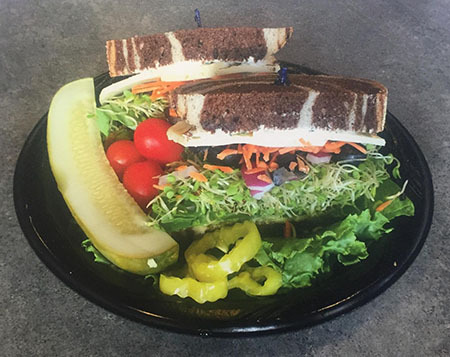 Havarti Cheese, Lettuce, Black Olives, Carrots, Onions, Sprouts, Guacamole and Chive Cream Cheese on Marble Rye Bread. The French Touch. Mmm! Buttery! Turkey, Crispy Bacon, Lettuce, Tomato and Mayo. Havarti & Colby Cheese, Tomato, Lettuce, Sprouts, Cucumber, Olives and Ranch Dressing. 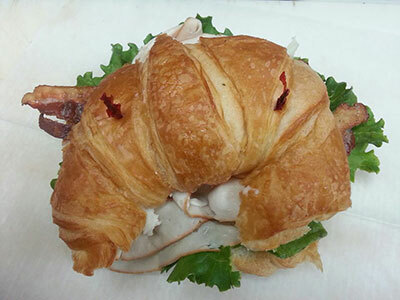 Smoked Turkey, Havarti Cheese, Tomato, Lettuce, Mushrooms and Mayo. Tuna Salad, Alfalfa Sprouts, Cucumber and Tomato. Grilled Chicken Breast, Ham, Swiss Cheese and Ranch Dressing. Chicken Salad, Pineapple and Lettuce. Ham, Melted Cheddar, Lettuce, Tomato and Bleu Cheese Dressing. Hot Roast Beef, Swiss cheese, Grilled Onions, Tomato, Lettuce and Horseradish Sauce on a Grilled Roll. Ham, Salami, Pepperoni, Provolone Cheese, Onions, Lettuce, Tomato, Pepper Rings, Green Peppers and Italian Oil on a Grilled Roll. Smoked Turkey, Havarti Cheese, Lettuce, Tomato, Onion, Pepper Rings, Guacamole and Horsey Sauce on a Grilled Roll. Havarti and Colby Cheese, Lettuce, Tomato, Olives, Mushrooms, Sprouts, Onions and Italian Oil on a Grilled Roll. Hot Colby, Havarti, Cream Cheese, Black Olives, Onion, Lettuce, Guacamole and Ranch Dressing. Turkey Breast, Swiss cheese, Lettuce, Tomato and Mayo. Tuna Salad, Lettuce, Sprouts, Tomato and Cucumber Slices. Ham, Pepperoni, Provolone Cheese, Pepper Rings, Green Pepper, Onion, Lettuce, Tomato and Italian Dressing. Smoked Turkey, Havarti Cheese, Tomato, Guacamole and Ranch Dressing. Roast Beef, Melted Swiss Cheese, Lettuce, Tomato,Grilled Mushrooms, Grilled Onions and Horsey Sauce. Colby Cheese, Cole Slaw, Onion & 1,000 Island Dressing. Cucumber, Carrots, Tomato, Lettuce & Russian Dressing. Chicken Breast, Parmesan Cheese, Romaine Lettuce & Caesar Dressing. Tomato, Lettuce & Black Olives. Mxed Greens, Feta Cheese, Beets, Olives, Onions, Pepper Rings, Tomato and Greek Dressing. Mixed Greens, Turkey Breast, Ham, Swiss & Colby Cheese, Hard Boiled Egg and Tomato. Mixed Greens, Roast Beef, Turkey Breast, Colby & Swiss Cheese, Cucumber, Green Olives and Tomato. Mixed Greens With Cottage Cheese, Cucumber, Tomato and Hard Boiled Egg. Mixed Greens, Cheddar Cheese, Tomato, Carrots, Black Olives and Cucumbers. Romaine Lettuce, Grilled Chicken Strips, Parmesan Cheese, Bacon, Croutons and Caesar Dressing. Mixed Greens, Grilled Chicken Strips, Bacon, Colby Cheese, Tomato, Green Olives, Cucumber, Guacamole and Ranch Dressing. 1/4 lb. Beef Hot Dog on a Steamed Bun. Served with Chips. 1/4 lb. Beef Hot Dog Smothered with Chili and Topped with Cheese and Onion. Turkey with Bacon, Lettuce, Tomato & Mayo on White Toast. Same Delicious Ingredients as our Regular Club, Just Half the Turkey. 1/2 lb. Roast Beef on a Grilled Roll Au Jus. Tuna Salad, Melted Colby Cheese, Tomato, Lettuce & Cucumber Slices on Grilled Pumpernickel. Lean Roast Beef, Melted Cheddar, Lettuce, Tomato and Horseradish Sauce on a Kaiser Roll. Lettuce, Tomato, & Mayo on a Kaiser Roll. A Vegetarian Garden Patty, Muenster Cheese, Tomato, Lettuce, Mushrooms and Ranch Dressing on a Onion Roll. A Vegetarian Black Bean Patty, Muenster Cheese, Guacamole, Cream Chees and Onions on a Toasted Onion Roll. Toppings: Onions, Green Peppers, Sliced Pickled Jalapeno Peppers & Pepper Rings FREE, Havarti Cheese 1.25, Extra Cheese 0.75, Cole Slaw 0.75, Lettuce 0.75, Tomato 0.75, Mushrooms 0.50, Guacamole $1.50, Pineapple Slices 1.20, Sprouts 0.75 We use Green Leaf Lettuce on all of our sandwiches! *We take every precaution to give you a gluten free product. 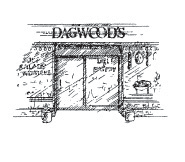 However our gluten free menu items are made in a facility that produces high gluten products. We assume no responsibility or liability.